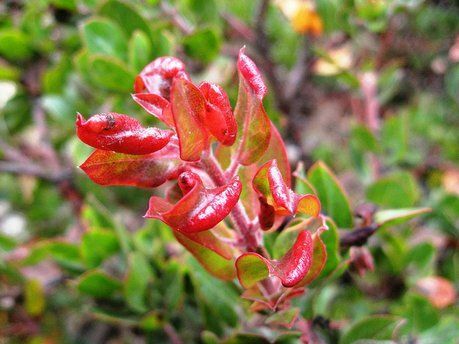 The common names for members of the Hardy perennial Arctostaphylos family include Bearberry, Bear's grape, Manzanita, Sandberry, Mountain box, Mealberry, Kinnikkinick, Hog cranberry. They typically flower from late summer to early autumn. Arctostaphylos are prostrate shrubs that have a dark evergreen foliage, they typically have many flowers of pink or white and they bear red fruits. They are ideal for use as ground cover in small bare places. Manzanita Photograph by Tom Hilton. 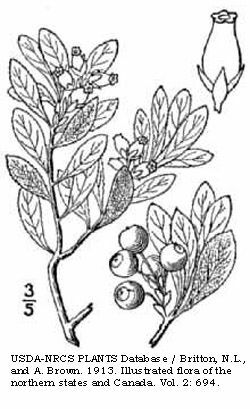 Common Names: Manzanita, Bearberry, Sandberry, Hog cranberry, Mountain box, Kinnikinick, Bear’s grape. Height: Prostate shrubs 2 to 12 inches (5 to 30 cm), through to small trees that may reach 20 feet (600 cm). Native: North America, Europe, Asia. Growing Region: Zones 3 to 7. Flower Details: Pink, white. Fragrant. Bell-shaped. Clusters of 2 to 20. Fruit: Small red, sometimes purple or black berries. Summer through autumn. Foliage: Mainly Evergreen, one species deciduous. Small oval. Spiral. Shiny. Green, underside often lighter than top. Sow Outside: Surface. Autumn. Spacing 12 to 24 inches (30 to 60 cm). Sow Inside: Soak seeds overnight. Mix seeds with moist sand, place in a freezer bag, then stratify by refrigeration for eight weeks. Use peat pots. Germination time: two to three months. Temperature 60 to 65°F (15 to 18°C). Either late in the winter or in the middle of summer; dependent upon transplanting time: Spring or autumn. Requirements: Full sunlight or partial shade. Soil pH 4.5 to 5.5. Most soils, best results in sandy and poor soil. Can survive in dry soils. Water only when extremely dry, and never overhead. Pine needle mulch. Prune/Shear to tidy plant. 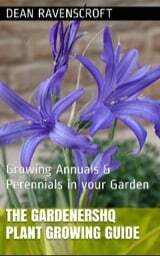 Propagate: cuttings in the autumn. Some species are very prone to fungal diseases. Do not disturb plant. It is best to sow Arctostaphylos outdoors in the Autumn on the soil surface. They should then be thinned to a spacing of 30 to 60 cm. Arctostaphylos can grow in either partly shaded conditions or in full sunlight. The soil should be sandy and acidic with a pH of 4.5 to 5.5. If starting of plants indoors Arctostaphylos typically require between two and three months to germinate, and seeds should be imbibed by soaking overnight, then being kept in a fridge, in the dark for two months in moist sand. 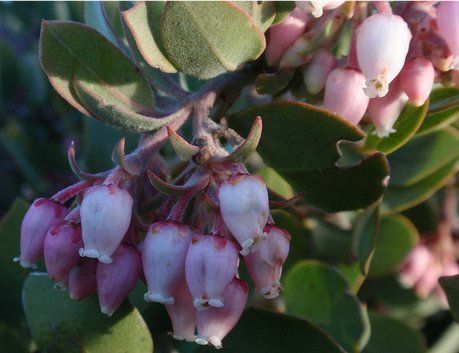 Arctostaphylos plants such as Bearberry and Manzanita are quite a difficult plant to look after and care for, they should only be watered at times of extreme drought and never fed. They should be regularly sheared in order to maintain a neat appearance, and mulched with pine needles. Once planted they should not be disturbed.